The 2006 Microsoft Mobile and Embedded Devices Conference in the US is now over, in addition to my entries in this blog, I covered the conference for pocketnow.com. Pocketpcthoughts also has a wrap up with links to Mike Hall's blog, the MEDC Flickr site, and MEDC.podcasts. It was decadence in Las Vegas, that sounds like an oxymoron, not really but it was an excellent party at the TAO night club. I know that E3 was the conference you needed to be for the stockholders, but you can't forget your base and the folks at MEDC are an important part of your base. With about 2000 attendees it is still an intimate affair with true believers, your G3 can get you in and out of Las Vegas in a flash. 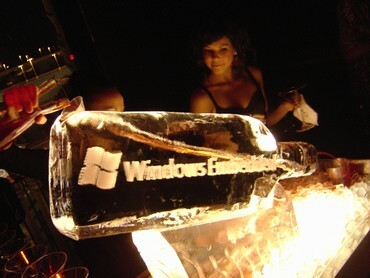 Anyway you missed a great party that rivaled some of the ones at early PDC's and Teched's. It was a great anniversary for 10 years of CE with Kobe beef, cake, TAO martinis (raspberry cosmos) and flowing sparkling wine!. The Sumo robot competition was a bit boring but in the end interesting to us techies. 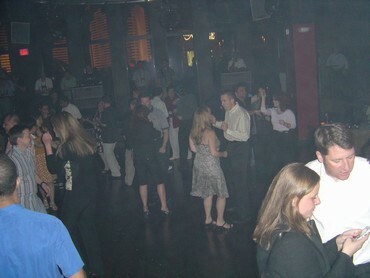 The disco side of the TAO night club finally got going when the DJ switched from disco to rock. Who knew techies could dance! Each heartbeat requires a transmission of 370bytes, if you assume a heartbeat timeout of 15 minutes x 4 per hour x 24 hours x 30 days, the data overhead is about 1.06MB. This is not very much for such a useful service. A question was raised about using WIFI with Direct Push. Currently it does not work, ActiveSync reverts to the timed pull model. The Direct Push heartbeat requires a cellular data connection. The issue stems around the fact that there currently is no way to wake up a device from standby via WIFI to receive the sync request from Exchange. They are looking at potential solutions. He also provided a list of carriers/OEM that have rolled out AKU 2.x ROMS on his blog here. Mike Hall demoed the building of an application in Visual Studio 2005 using CE 6.0 to manage Point Of Service hardware with an Intermec RFID reader and a Symbol bar code scanner. It really showed off the simplicity of coding device functionality with Visual Studio 2005. 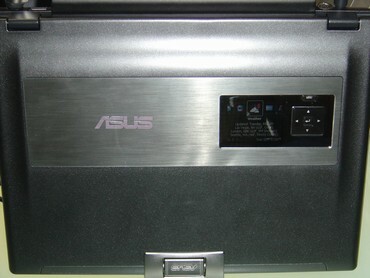 The SideShow LCD on the back of a prototype laptop. 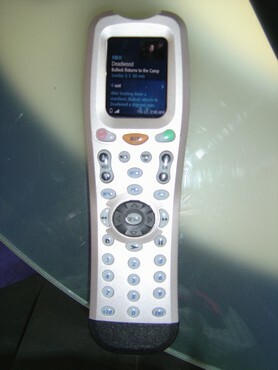 A Windows Media Center remote control with a SideShow LCD displaying Media Center content. Collin also showed off a Sumo Robot that is programmed with Visual Studio 2005 and the .NET Micro Framework. Attendees have been invited to program their own for a competition on Wednesday night. Collin Miller standing over his Sumo Robot. The Dresser Wayne Ovation iX fuel dispenser in the background. Dave Karle demoed his version of a Sumo robot with a SmartPhone that transmitted video. He also showed off SQL Everywhere, a version of SQL Server that is file compatible between Windows CE/Mobile devices and Windows XP/Server 2003. He also showed off XNA, a cross platform gaming technology that allows a game's logic code to be ported between Windows Mobile, the Xbox 360, and Windows XP with 99% code compatibility. The graphic rendering needs to be adjusted for each platform but this technology addresses the logic portion of games. 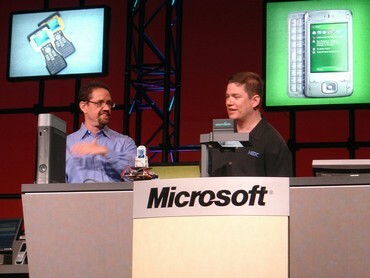 Todd Warren and Dave Karle (right) with his Sumo/SmartPhone robot. 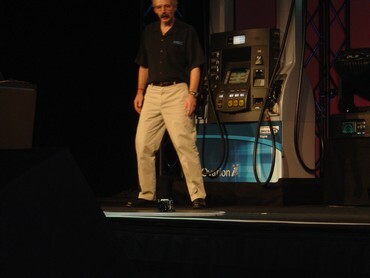 The MEDC 2006 keynote took place this morning highlighting the major technologies presented at this conference. The Presenter included Pieter Knook, Senior Vice President (in charge of Mobile and Embedded Devices Division), Todd Warren, Corporate Vice President (head of development), Mike Hall, Technical Product Manager, and Collin Miller, Group Manager (.NET Micro Framework). 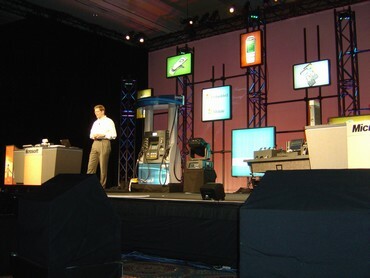 Two themes emerged from the keynote, the release of Windows CE 6.0 beta and it's integration into Visual Studio 2005. The emphasis for this conference is to simplify a developers task for building a device OS' and applications. "Simplify and enrich the life for people around the world with devices they can't live without"
The most visible product in his division, is the Windows Mobile platform with 115 mobile operators, 100+ phones in 55 countries with 47 device makers. Some big news for us GSM Windows Mobile users in the US is that Cingular and T-Mobile will both be releasing an AKU 2.x based ROM with MSFP (Direct Push email) this summer. Microsoft has been targeting Windows Mobile 5.0 and its update for business productivity. The broader market will be addressed with the next major release to vendors in 2007. The SlingPlayer Mobile was highlighted as an advanced Windows Mobile application. The Microsoft Point Of Service (POS) retail system on IBM hardware is based on XP Embedded. The Dresser gas station pump based on CE. Dresser was named the partner of year for the development of this product. Microsoft's Mobile and Embedded Developers Conference (MEDC) 2006 is being held this week at the Venetian Resort Hotel and Casino in Las Vegas. This conference is organized under the purview of Microsoft's Mobile and Embedded Devices group (MED). Two of the primary product families that MED is responsible for are Windows Mobile and Windows Embedded. Microsoft describes the strategy for the group as "...one of seven of Microsoft's profit and loss centers, which is to deliver the best software building blocks and tools to enable rich devices and device experiences; invest in end-to-end device experiences (such as the Windows Mobile for Smartphone, Windows Mobile for Pocket PC, and Windows CE for Automotive), and enable users to take advantage of rich applications and services through support for managed code and the .NET Framework. Windows Mobile and Windows Embedded operating systems power a wide variety of devices—ranging from small, handheld mobile devices to large industrial automation machines—all with highly customized device designs that require a flexible platform, easy-to-use development tools, and access to the latest networking, communications, and multimedia technologies." This conference will celebrate the 10th anniversary of the Windows CE kernel and is the basis for Windows Mobile that runs our beloved Pocket PCs and Smartphones. There are hundreds of other products based on Windows CE. They range from music players, to dedicated GPS systems, gas station pumps, television set top boxes, automotive telematics, and medical devices. The other major kernel that the MED group is responsible for is Windows Embedded. This kernel is the basis for products like the tablet PC, point of service systems and the Ultra Mobile PC. I am on my way to Las Vegas today and will be blogging here and on pocketnow.com to bring you my take on what's happening at MEDC 2006.